Hi there! It’s Paige, back again with another easy DIY for you! Elbow patches are back in style, ladies! I remember when I thought elbow patches were absolutely hideous. I couldn’t figure out why in the world anyone would want some extra piece of fabric stuck to their shirt, let alone on their elbow. Little did I know, soon I’d be decking out all my clothing with cute, sequined, and sparkly elbow patches! It can become quite expensive to buy a whole new wardrobe to fit the current fashion trends, which is why I love myself an easy DIY. 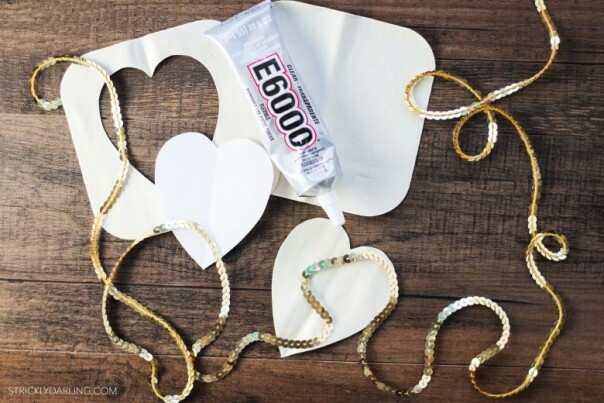 Valentine’s Day is just a few days away *cue the awws and ooos and joyful moods*, which can either elicit a happy and love stricken response, a solemn and long sigh, or an “ew. love.” from all those kiddos out there. I may not have a special someone to take me out on an adventure fit for the most hopeless of romantics, but I do have a bucket load of single friends, and we’re going to have a good time. Now of course for this good time, I’ll need an outfit to live up to the expectations of a fabulous party. That’s where my crafty side takes over and whips up a sweater with two shiny and sparkly elbow patches, perfect for the most extraordinary party. Begin by tracing your heart template onto the iron on patches. 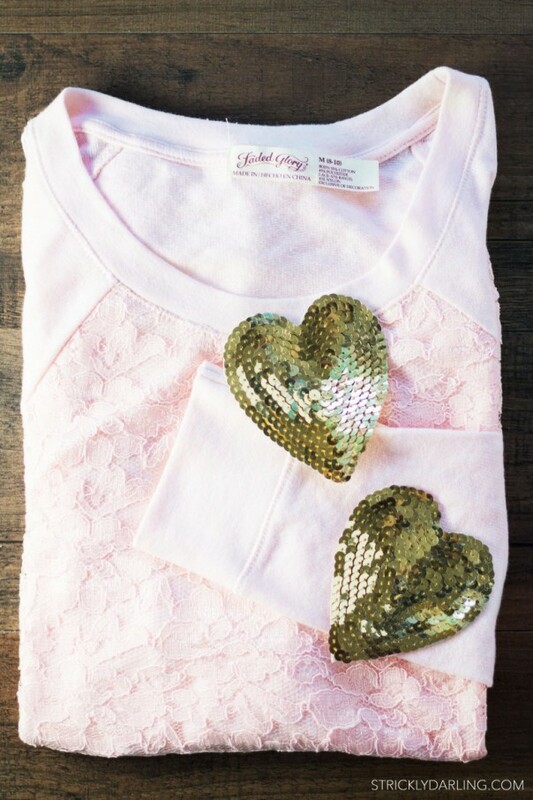 Make sure that the heart is big enough for your liking on the sweater, then cut out the heart patches. 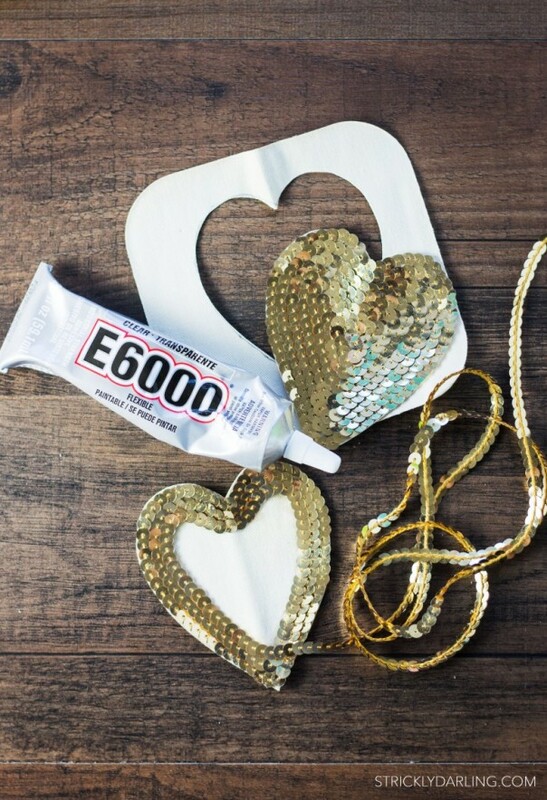 Put a small line of glue on the outer edge of the heart, and carefully lay down the sequin strands. Don’t coat the whole patch with glue all at once, as it will dry quickly. Continue working your way around the heart, slightly overlapping each row. Once you reach the end, place a stray sequin on top to conceal the end thread, if needed. Try on your sweater, and mark with a fabric marker or pin where the elbow patches should lay. 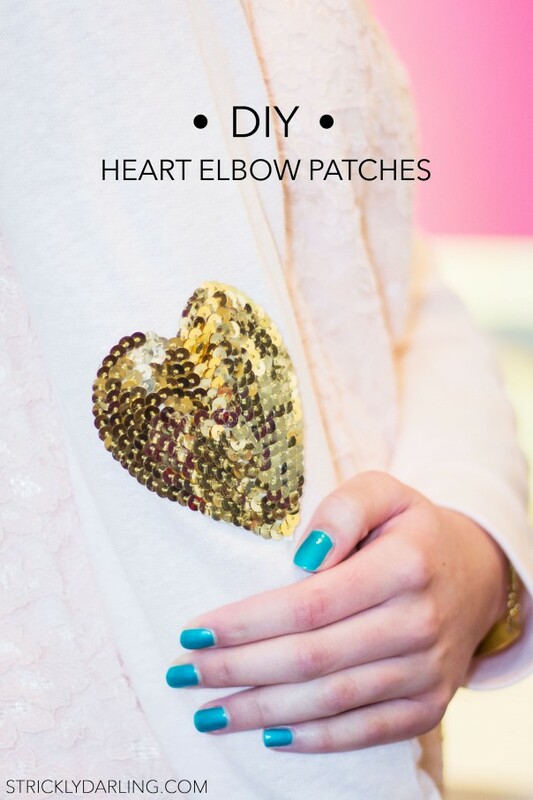 Follow the instructions provided with your iron ons to iron the heart patches to your sweater. Be sure to cover the sequins with a cloth while ironing, or they could melt. If you have trouble getting them to stick, you can easily hand stitch them on with a needle and thread, or do that in addition for extra stability. For more darling DIY ideas check out Strictly Darling.